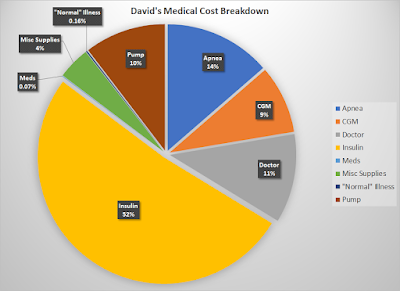 I haven't done this on my blog, but I wanted to look at how my health costs were broken down, and the easiest way to do this is to look at where my (insurance company's) money is going. I know that I have regular fixed costs, mostly my out of pocket maximum (which went up in 2017, but that's another thing) and the rest of my expenses are covered under my insurance as long as insurance says they'll cover it. I decided to put together a complete breakdown based on my insurance claims and will now show that chart below. Let's start by explaining my categorization here. I know the things that go into my costs, insulin, CGM (continuous glucose monitor) and pump are things that are used on a daily basis for me specifically for diabetes. Apnea is the cost of the sleep study and supplies based on the sleep apnea diagnosis that I received last year (that was a big chunk of my cost last year) and Doctor is doctor's office visits, and associated appointments with the endocrinology team. Misc supplies is things like test strips and lancets (no, I don't change them that often, they just force me to get them). Meds are my standard blood pressure medications. "Normal" Illness are things unrelated to diabetes, and consists of a clinic visit and medication for a bad cough that I was having (steroid which caused more insulin usage!). Okay, so looking at this chart...the cost that is the same throughout is Insulin, it accounts for the majority of my medical costs (through insurance) and is something I will need weather I am on an insulin pump, or on multiple daily injections, or not. It is a requirement for a Type 1 diabetic and is a HUGE cost. Doctor's visits (endocrinologist mostly) account for 11% of my 2016 medical costs, which seems about right, since I'm seeing my endocrinologist every 4 months and seeing a RNP every 2 months for consistent check-ups. Pump and CGM account for a combined 19% of my costs for health care a year, yes...these are 'convenience' costs, but they are also costs that are helping. As I previously posted on here, my Hemoglobin A1c was able to drop to 7.1 after more intensive use of these therapies. In 2016, I achieved an A1c sub-7 for the first time in as long as I can remember since being diagnosed, and I attribute much of that to the access to a CGM that I have. On top of the financial costs of diabetes as a chronic illness, I also think about the emotional and physical costs of diabetes as a chronic illness. Diabetes is something I think about every minute of every day, I am mentally drained every day on account of the sheer mental capacity it requires to know the management of this disease, that then leads to physical exhaustion because my brain is always running cycles and because my brain is always on, it leads to a pretty bad lack of sleep. Lack of sleep leads to exhaustion physically and laziness (bad diet) which leads to more physical exhaust. There are certainly days that cost me more both in financial cost and physical/mental cost, but I continue to move forward and persist with the things that I have to do, in order to stay alive. Just like the non-financial cost, financial cost can change on a dime for any other health-related cost, and that's what I put under "Normal" Illness. If I were not a diabetic, not dealing with the further complications of a chronic illness, I would think "Normal" Illness would be a gigantic chunk of my annual health costs. I'm fortunate that I am able to have Health Insurance cover all of my costs (and the ability to appeal to someone who will listen for things that aren't covered). I gauge my yearly craziness on how quickly I hit my out of pocket maximum, in 2016, I hit it in March, in 2017 (the current year) I hit it in February. Since insulin is such a high cost for me, it's what triggers my quick use of my out of pocket maximum every year, it's not a question of if, but when for me.